The AutoQuad ESC32 Configuration Utility (AQ ECU) is the essential software companion to any AutoQuad ESC32 hardware. Though you still can use the AQ QGC for ESC32 v2, we highly recommend to use the ECU, published by World Design Group. Built-in custom serial console for “advanced” CLI use or diagnostics. Firmware update “wizard” guides and automates upgrades of supported ESC hardware. Looks and runs as a native application on Windows and Mac OS X operating systems (no Java/etc). Known temporary issue with the Mac OS X version: the app might crash if logging is stopped while telemetry is still running (will be fixed on next update). For now just stop the telemetry BEFORE you stop the logging. If the automated update process doesn’t work or is not available for some reason (such as an offline install), simply download the latest Installer package from the links above, and install it in the same place (folder) as the old version. For more details about installation and updates, see the Installation page. Licensed for use with any ESC32 version (v2 or v3). This license must be purchased from World Design Group directly. 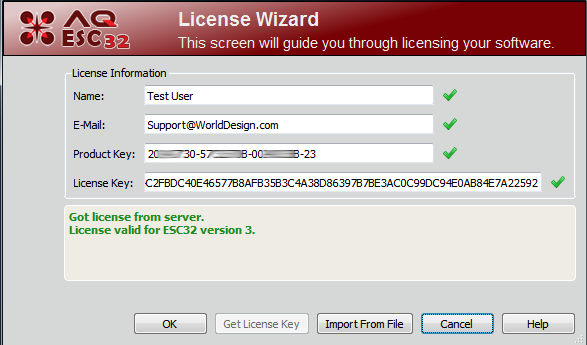 You may purchase a license for use with any ESC32 hardware version on the WDG Product Web Page. 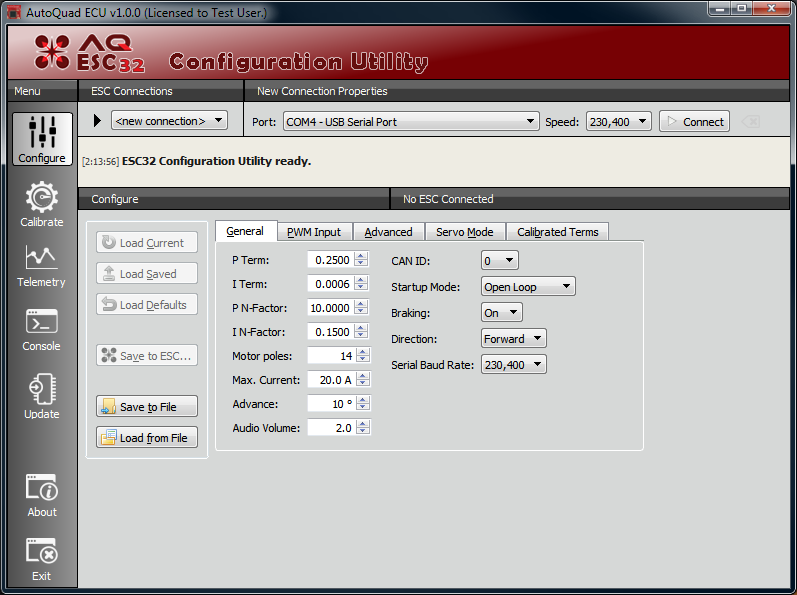 If you only intend to use this software with ESC32 v3, your license is already included with your ESC32 purchase. Any genuine ESC32 v3 serial number can be used to activate the ECU software. For more details on activating a software license, see the License Activation instructions. This page was created on 5-Aug-15 by MaxP. Last modified on 1-Sep-15 by kinderkram.